Here's Week 4 homework from Designing with Color and Light with Nathan Fowkes via Schoolism. For this assignment we had to target specific emotions we wanted to elicit in each scene. 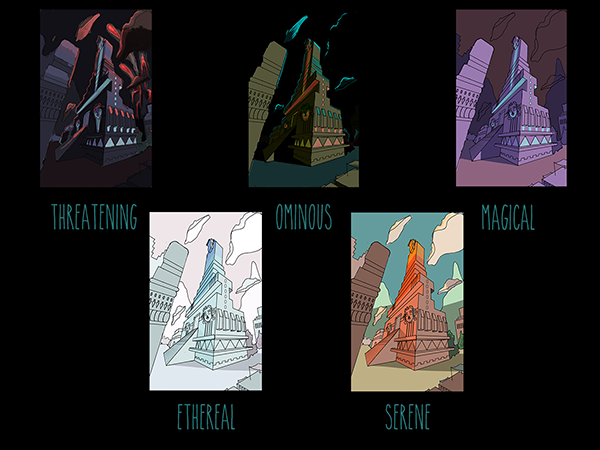 We chose five emotions and then re worked the color palette of an environment five times. My emotions were threatening, ominous, magical, ethereal, serene (clockwise). I wanted to take these to a more finished level, but as it was I already put in about 8 hours of painting. That being said, I am extremely happy with how they turned out both with the lighting and the color schemes. I'd love to hear your thoughts and comments!